In summer 2016 I took part in the first KnitPro design-along, dedicated to Knit For Peace charity program. You can purchase an e-book which includes twelve knit and crochet motifs (plus ideas for blanket layouts using the squares and instructions for different borders) for £6.00 here. I submitted eight Tunisian entrelac patterns and one of these motifs has been released (you can find it in the e-book). 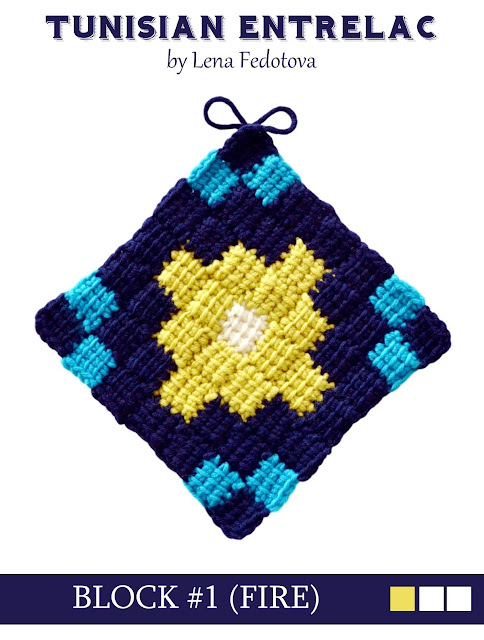 I am going to share the rest of the patterns for free in the Cup of Stitches blog. I gave them some simple names and sorted them depending on the difficulty level. The simplest ones use one color per round/row. The other ones use a couple of colors per round/row and I provide the detailed instructions for changing colors in a special manner (to avoid extra "cut&fasten off"). 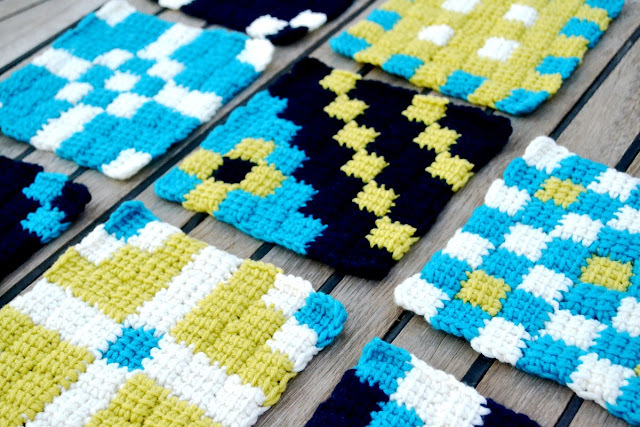 The patterns assume basic familiarity with Tunisian crochet, specifically how each row is worked as two separate passes and how to work Tunisian simple stitch. Each element of the motifs is small enough to place all of your stitches on a regular crochet hook. With C2, pull up a loop from any corner st of Center Square, ch 4. Row 1: Starting in 2nd ch from hook, pull up 3 loops across ch and 1 loop from next border st (5 loops on hook). RetP (for this and all remaining squares): *YO, draw through 2 loops on hook, repeat from * across, leave last loop on hook. With C2, pull up a loop from right corner st of Top Square (lay your yarn loosely up to corner, do not pull. The strand will be worked over and hidden under the stitches of last square), ch 4. Repeat Top Square instructions. Repeat Top Square and Corner Square instructions three more times for 8 squares in total. Cut yarn and fasten off. With C3, repeat Second Round of Squares instructions working two Corner squares per side for 12 squares in total. Cut yarn and fasten off. With C3, pull up a loop from left corner st of any Top Square. Work three Corner Squares. Cut yarn and fasten off. Repeat for the remaining sides. With C4, repeat First Partial Rows instructions, working two Corner Squares per side. With C3, repeat First Partial Rows instructions, working one Corner Square in each remaining corner. 1. Original motif layout (left). 2. Additional motifs: the colors of center square and two first rounds of squares are switched (right). 3. Two first rounds of squares are worked in different colors (left). 4. Additional motifs: all rounds/rows of squares except the last two (second and third partial rows) are worked in different colors (right).